A canvas printed thangka of Dzambala, the Buddha of Wealth. Dzambala is particularly beneficial for those facing financial difficulties. 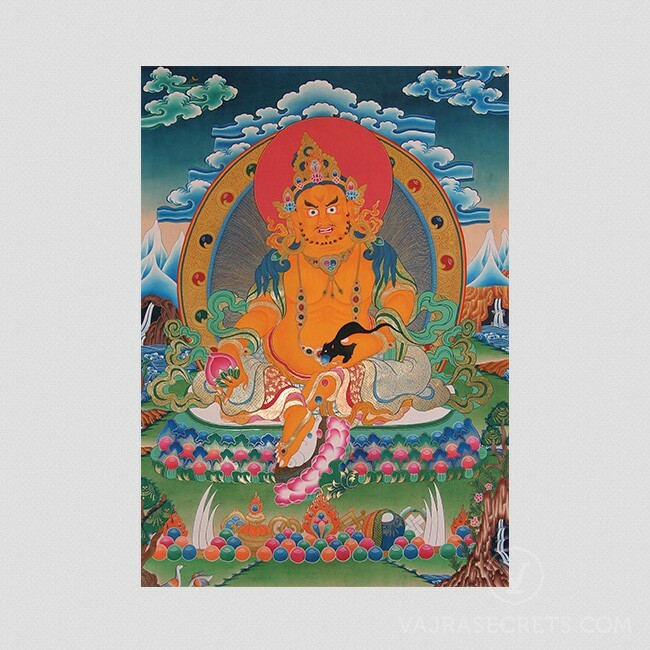 A canvas printed thangka of Dzambala, the Buddha of Wealth. The rich gold colouring of Dzambala's skin represents great increase and growth. His form is short, fat and stout - synonymous with wealth and luxury. He has an arrogant expression on his face and sits in royal posture: this acts as a warning to tell us if we continue to look and act in this arrogant way in our attempts to get material wealth, we actually gain poverty instead. Dzambala holds a fruit in his right hand signifying that following his practice can "bear the fruits" of our efforts to gain spiritual attainments and enlightenment. In his left hand, he holds a mongoose, which in ancient India stood as an omen of good things to come. The mongoose spits beautiful precious wish-granting jewels, and both work to attract us to practice Dzambala with an immediate promise of wealth. In the short term, Dzambala can bring us material wealth and help us overcome financial problems. More importantly however, his practice helps us overcome an inner emotional powerty: miserliness, greed and the inability to give or share. Dzambhala's blessings and the value of his practice are universal. Keeping an image of him, or giving his image away as a gift is beneficial to anyone, anywhere. * As each print is made-to-order, this item will be shipped within 7-10 working days from the date of purchase. * As each thangka varies in height and width based on the size of the original art piece, the finished product will vary slightly from the listed sizes. * Does not include traditional brocade frame.